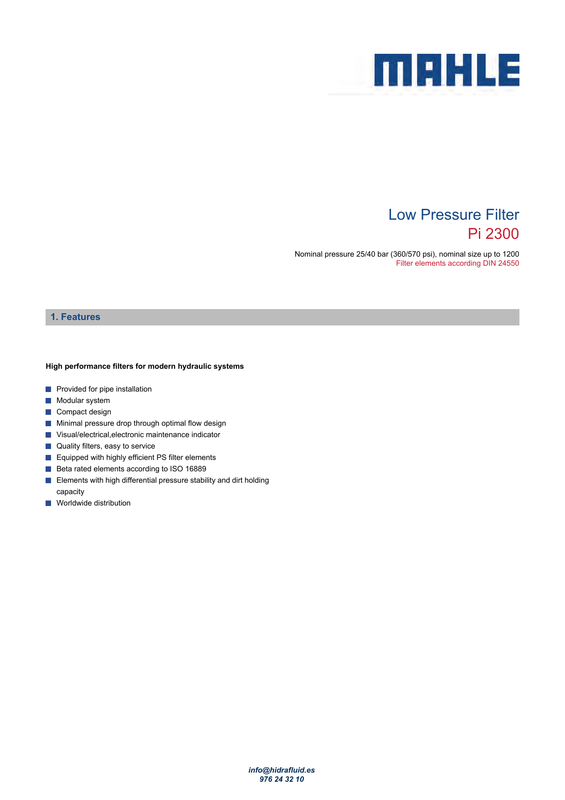 When using filter with non bypass configuration is selected, the collapse pressure of the element must not be exceeded. available in the maintenance indicator data sheet. department will be pleased to offer you advice. standard version can be used for liquids based on mineral oil (corresponding to the fluids in Group 2 of Directive 97/23 EC Article 9). Subject to technical alteration without prior notice. maintenance indicator must be visible. normally closed position or vice versa. 10.3 When should the filter element be replaced? During cold starts, the indicator may give a warning signal. element must be replaced after the end of the shift. the system. Afterwards follow instructions of the manufacturer. 1 . Stop system and relieve filter from pressure. 4 . Check seals for damages. Replace, if necessary. the plastic bag and push element over spigot in the filter head. telescope the second element and locate it. on the centre rod and tighten strong. Filter must be bleeded!